← You can freeze that? A couple of weeks ago I was cooking supper when I looked out the window to see if my husband was home yet, when I realized the sun was still shining at five o’clock. I was so happy I texted my group text girls to tell them. The days had been getting longer, but I had failed to notice it until that moment. 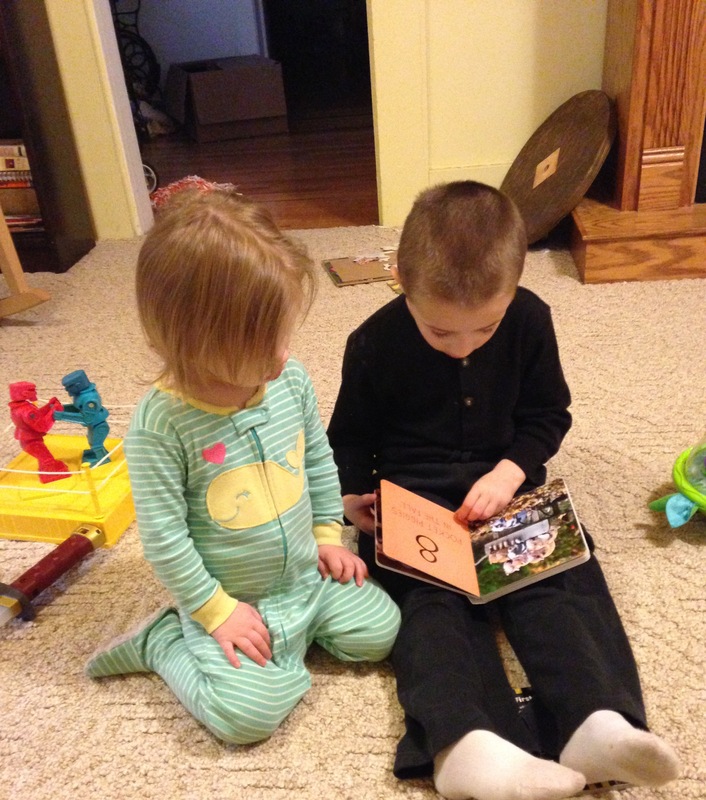 I was reminded of that this morning when I took this picture of my oldest son and his 2 year-old sister. Four years ago, when I had just a 1 year old and an infant, I could not imagine this day. I was surviving moment by moment, day by day, praying my oldest didn’t hurt his brother (again) or destroy the house (again) while I fed his baby brother. I have a Facebook album dedicated to the disasters my boys created in those early years of chaos – flour and sugar poured all over my kitchen, foods smeared, bookshelves completely emptied. Repeatedly. Walls scribbled on. Repeatedly. In those moments, I couldn’t see a day in my future when I would not have a daily shenanigan to share. But here we are. Now I have a 5 year old that can pick up the baby when she’s crawling toward the fireplace, fix bagels and milk, and read to his sister. I have a 4 year old that can feed the animals, entertain himself with Legos for an hour, and play outside without running to the road every single time. (He still can’t resist a mud puddle, even in 30 degree temperatures. lol) My boys no longer empty every drawer of clothes in their bedroom. (However, their little sister does it for them at every opportunity. Ha!) Those 2 under 2 may still be occasionally creating chaos and making messes at 5 and 4, but they’re also big enough to clean up those messes. 😊 Oh what a difference a few years makes. Take heart mamas of littles. The seasons change slowly, but one day you will look up from your work, and the sun will be shining at five o’clock.